Sign Plus, Fife’s very own award winning sign company is based in the coastal town of Dalgety Bay servicing Scotland and the rest of the UK. We specialise in the design, manufacture, installation and maintenance of all types of signs. Our sales team with the support of our experienced in-house designers, sign makers and fitters are here to offer our guidance and advice to provide bespoke signage solutions that meet and exceed our valued clients expectations. 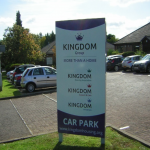 For over twenty years we’ve been at the forefront of great signs across Scotland from our base in Fife and pride ourselves on providing any sign for any purpose. We are sure that our attention to detail will ensure Sign Plus are raising standards in all types of visual communication for the next twenty years across Scotland. Copyright © Sign Plus Limited 2016 All Rights Reserved. Head Office: Sign Plus Ltd, Bristol House, 15 Ridge Way, Dalgety Bay, Fife, KY11 9JH. All calls to 01383 823000 are recorded for training and validation purposes.